Roya Series Glass Shelves are an elegant and attractive shelving option. Roya Shelves DO NOT come with installation hardware like shelf brackets. 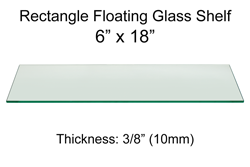 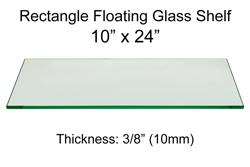 If you are in need of a rectangular glass shelf for your books, picture frames, colectibles, and decorations, you should consider the flat form-factor of the Roya series glass shelves. The beautifully tempered and polished Roya shelves come in Clear Glass and a variety of standard sizes: 6"x18", 6"x24", 6"x30", 6"x36", 8"x18", 8"x24", 8"x30", 8"x36". Elegant yet demure, a Roya glass shelf blends into any décor. The effortless sophistication of these unique flat glass shelves makes them a perfect accompaniment to any wall space.